141 disclosures were received from 206 inventors from 47 University departments and divisions. 50 external collaborators from 31 institutions, agencies, and corporations were also named as inventors. 4 copyright registrations, 2 trademark registrations, and 100 patent applications were filed in FY 2018. Of the patent filings, 40 were new matter filings, while 60 were continuations of applications filed in previous years. In FY 2018, the University of Rochester was granted 45 U.S. patents and 32 foreign patents. These 77 patents cover 50 different technologies. In FY 2018, the University of Rochester executed 36 new license and option agreements and monitored 166 active agreements. 62 of these agreements generated revenue. In FY 2018, the University of Rochester received $1,519,903 in licensing income. 106 disclosures were received from 200 inventors from 32 University departments and divisions. 15 external collaborators from 14 institutions, agencies, and corporations were also named as inventors. 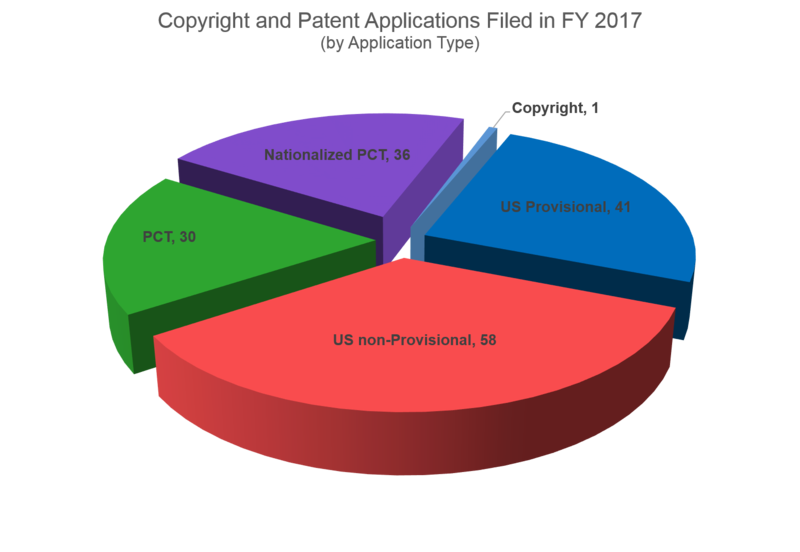 1 copyright registration and 165 patent applications were filed in FY 2017. Of the patent filings, 42 were new matter filings, while 123 were continuations of applications filed in previous years. In FY 2017, the University of Rochester was granted 45 U.S. patents and 32 foreign patents. These 77 patents cover 50 different technologies. In FY 2017, the University of Rochester executed 30 new license and option agreements and monitored 146 active agreements. 72 of these agreements generated revenue. In FY 2017, the University of Rochester received $10,378,449 in licensing income. 142 disclosures were received from 201 inventors from 48 University departments and divisions. 44 external collaborators from 27 institutions, agencies, and corporations were also named as inventors. 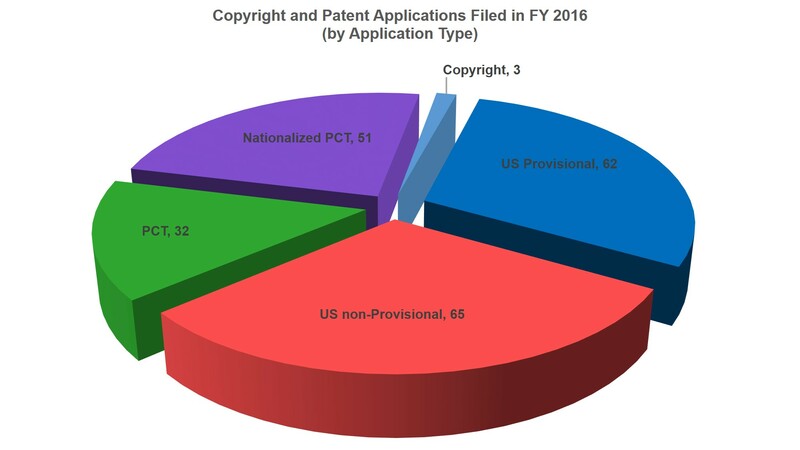 3 copyright registrations and 210 patent applications were filed in FY 2016. Of the patent filings, 67 were new matter filings, while 143 were continuations of applications filed in previous years. In FY 2016, the University of Rochester was granted 48 U.S. patents and 21 foreign patents. These 69 patents cover 56 different technologies. In FY 2016, the University of Rochester executed 31 new license and option agreements and monitored 137 active agreements. 68 of these agreements generated revenue. In FY 2016, the University of Rochester received $22,877,004 in licensing income. 151 disclosures were received from 253 inventors from 56 University departments and divisions. 58 external collaborators from 31 institutions, agencies, and corporations were also named as inventors. 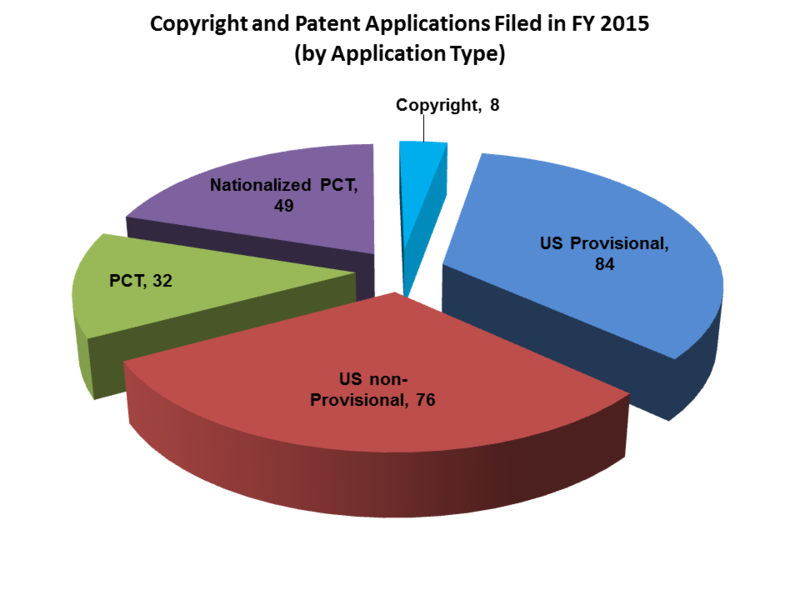 8 copyright registrations and 241 patent applications were filed in FY 2015. Of the patent filings, 76 were new matter filings, while 165 were continuations of applications filed in previous years. In FY 2015, the University of Rochester was granted 53 U.S. patents and 21 foreign patents. These 74 patents cover 61 different technologies. In FY 2015, the University of Rochester executed 24 new license and option agreements and monitored 129 active agreements. 73 of these agreements generated revenue. In FY 2015, the University of Rochester received $22,386,564 in licensing income. 155 disclosures were received from 250 inventors from 51 University departments and divisions. 51 external collaborators from 28 institutions, agencies, and corporations were also named as inventors. This is more than a 10% increase over disclosures received in FY 2013. 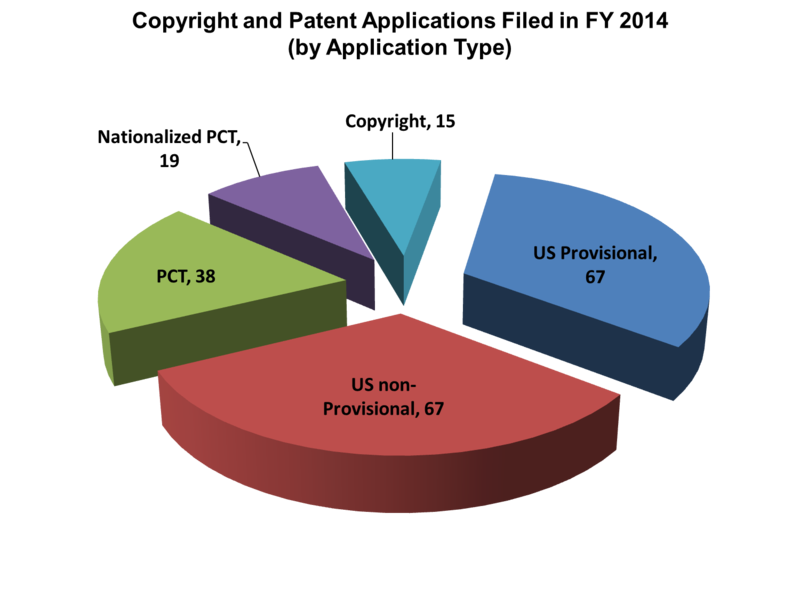 15 copyright registrations and 205 patent applications were filed in FY 2014. Of the patent filings, 70 were new matter filings, while 135 were continuations of applications filed in previous years. In FY 2014, the University of Rochester was granted 50 U.S. patents and 20 foreign patents. These 70 patents cover 64 different technologies. In FY 2014, the University of Rochester executed 31 new license and option agreements and monitored 120 active agreements. 64 of these agreements generated revenue. In FY 2014, the University of Rochester received $25,639,469 in licensing income. 140 disclosures were received from 220 inventors from 48 University departments and divisions. 34 external collaborators from 22 institutions, agencies, and corporations were also named as inventors. This is a 6% increase over disclosures received in FY 2012. 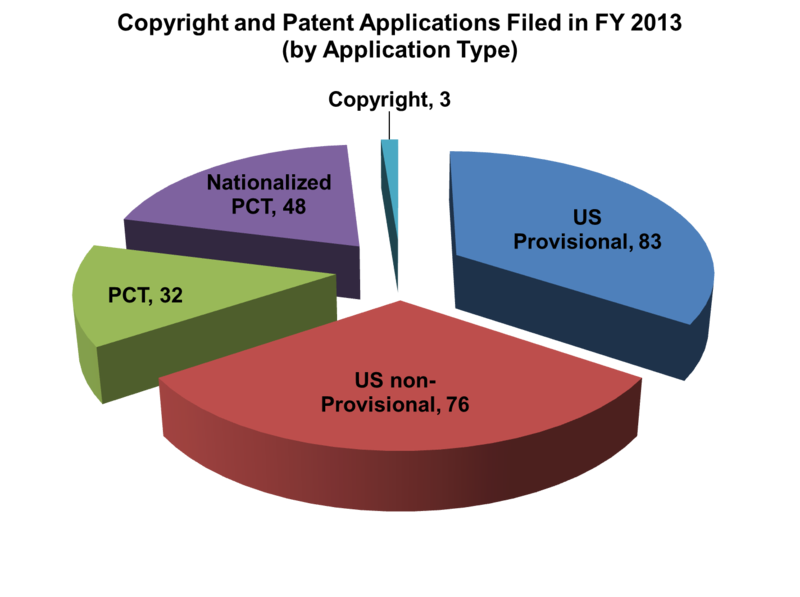 3 copyright registrations and 240 patent applications were filed in FY 2013. Of the patent filings, 77 were new matter filings, while 163 were continuations of applications filed in previous years. In FY 2013, the University of Rochester was granted 31 U.S. patents and 26 foreign patents. These 57 patents cover 45 different technologies. In FY 2013, the University of Rochester executed 13 new license and option agreements and monitored 130 active agreements. 56 of these agreements generated revenue. In FY 2013, the University of Rochester received $29,389,288 in licensing income. *Source: 2013 AUTM Annual Report as compiled by the Association of University Technology Managers (autm.net).